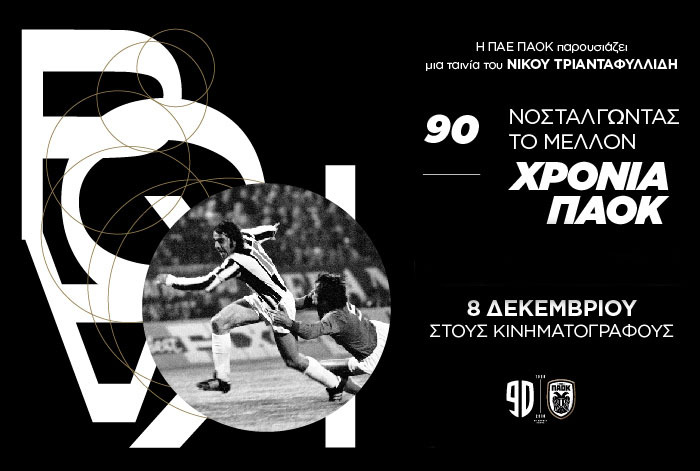 Make your way through 90 years of PAOK history in 90 minutes, thanks to the special documentary feature directed by Nikos Triantafyllidis. This film earned the Greek Film Critics Association (PEKK) award in the 57th Thessaloniki International Film Festival. The documentary will be released in movie theatres on 8 December. The 90-minute documentary “90 years PAOK: Nostalgia for the Future” isn’t just a simple recording of the club’s history. It’s a live film diary narrating the milestones of the team along with historical and social developments. It’s a journey through time and space, a cinematic essay on the club. During the five-month long shooting, Nikos Triantafyllidis visited all the places where the club’s heart beats strongly and got touching confessions by veterans and younger players, coaches, club administrators and faithful fans who honoured and continue to honour the “heavy shirt” of PAOK. By producing the stub of your cinema ticket in PAOK FC Official Stores (Toumba Stadium and Ag. Sofia Str. ), you are entitled to a 20% discount in your purchases.